Spring Housecleaning?? Bag up those old clothes you haven’t worn in years and give them to Zion Church. 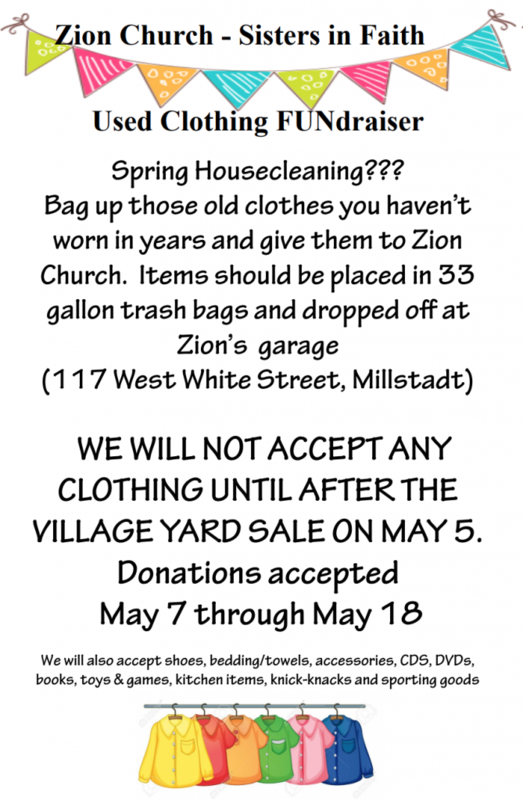 Items should be placed in 33 gallon trash bags and dropped off at Zion’s garage – 117 West White Street, Millstadt. We are also accepting bedding/towels, accessories, CDS, DVDS, books, toys & games, kitchen items, knick-knacks and sporting goods. Please note: we will not accept any items until after the Village Yard sale on May 5th. Drop off dates are from Monday, May 7th through Friday, May 18th.